Is it worth making the leap to the new Mac OS? Apple's preview of OS X Mountain Lion was revealed at Apple's developer conference in June. Predictably, it garnered all the usual oohs and ahhs, but what's it really like? Now we can find out, since Apple's new OS is here - check out our Mountain Lion review. It brings more than 200 new features to boost the way you use your Mac. Making use of iCloud, Mountain Lion claims to make it easier than ever to keep all of your media, documents and important information in one place and, as a result, available across all of your devices. It also adds deep integration with Facebook and Twitter, turning your Mac into a highly sociable machine. This puts it in line with its iOS siblings, which now boast baked-in Twitter access and have also seen the Facebook app storm the App Store charts. The gradual merging of iOS and OS X features continues with the arrival of Messages, Reminders, Notifications and Dictation in Mountain Lion - the aim being to make switching between any of your Apple devices as seamless as possible. But do you need these new bells and whistles or should you be content with what you've got? We weigh up the new features as well as the upgrade considerations in order to provide you with an answer. A quick trip to the Mail, Contacts & Calendars section of your Mac's System Preferences pane allows you to sign in to a number of social networks including Twitter, Flickr, Facebook and Vimeo. Once you're signed in, you can share links, photos and more to your friends, right from the app you're currently using. Want to share an interesting blog post with your followers? Or perhaps you've taken a funny picture with Photo Booth that you want to use as your Facebook profile picture. Then simply click the Share button, found in a wide range of apps, and select the network you want to send your content to. A pane appears with your content included, allowing you to add a message and post it. An additional feature, specific to Facebook, allows you to select which of your Facebook friends can see an update. The new Notifications feature will also alert you to messages and other information from the social networks you're logged in to. And, from the Notification Center, you can quickly send updates to your social networks in a few simple clicks. Facebook integration also enhances your Mac's contacts list, pulling in the contact details for all of your Facebook friends as well as their profile picture, and adding them to your address book. If a friend updates their contact information or profile picture on Facebook, your address book will also update so you've always got the right details stored. Mountain Lion brings the Game Center experience, previously only available for iOS devices, to the Mac. If you already have a Game Center account you can log in and access all of your game stats and high scores as well as view friend requests and receive game suggestions. Games you've played on iOS devices will be listed as well as those you download from the Mac App Store, with a link within the app allowing you to view all available Game Center-compatible games. Game Center isn't just about tracking your gaming prowess, though; it also offers a route to quickly play games against friends or recommended opponents. Regardless of whether the other player is using a Mac, an iPad, an iPhone or an iPod touch, as long as they have the same game linked to their Game Center account you can play against each other. Head-to-head games, turn-based games and more are all available and game invites can be sent directly from Game Center to another user to challenge them to a game. If you receive a game invite, accepting it launches the game on your Mac automatically. You can even use AirPlay mirroring to play the game on your HDTV if it's connected to an Apple TV on your wireless network. Game Center in Mountain Lion looks set to open up the fairly small world of Mac gaming to a whole new audience thanks to its cross-platform abilities, and there are sure to be a lot more iOS favourites heading to the Mac in the coming months. As you install more and more apps on your Mac, the number of alerts you receive also increases. One app needs a software update, another is alerting you to an incoming call and so on. In Mountain Lion, the clutter of different notifications is streamlined and redefined with Notification Center. Notification Center offers a clutter-free way to alert you to all manner of events such as email messages, tweets and calendar alerts. Notifications from applications you've authorised appear at the top-right of the screen and can appear as banners or alerts. A banner appears and then disappears after a certain amount of time, whereas an alert stays on the screen until you dismiss it. Clicking on an alert takes you to the app from which it came and there are also alert-specific actions for apps like Calendar, where you can select options such as Snooze on the alert. You can view all of your notifications quickly and at any time using multi-touch gestures (assuming you have a trackpad). You simply swipe two fingers from right to left to reveal Notification Center, which slides out from the side of your screen. Notification Center includes all of your recent Notifications organised by application and allows you to click on each one to view it. You can even update your social networks from within the Notification Center interface and access the Notification Center pane by clicking the Notification Center icon on your Mac's menu bar. Remember when displaying your Mac's desktop on your TV was a complex mix of adaptors, cables and making sure your computer was close enough to the TV? That scenario becomes a thing of the past with AirPlay in Mountain Lion. A new AirPlay icon appears in the menu bar of Macs running Mountain Lion that allows you to select your Apple TV and mirror your display on your TV. Whether you want to show a web page or a presentation, AirPlay Mirroring makes the process a whole lot easier. 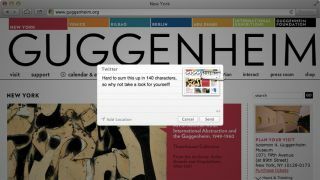 Messages in Mountain Lion is the perfect hybrid between OS X's former messaging app, iChat, and iMessage on the iPhone, iPad and iPod touch. Conversations you have with other iCloud users are kept in sync on all of your iOS devices and now on your Mac. Now you don't have to stay at your desk in order to carry on conversations with friends, and you can even share photos, documents and HD video through the chat interface. A FaceTime call can also be initiated right from the Messages interface.